In a recent article for Mind Body Green, Mary Beth Sammons, coauthor of The Grateful Life, outlines ways daily gratitude is beneficial, and how to make it a habit. 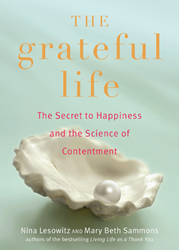 Mary Beth Sammons is co-author, with Nina Lesowitz, of The Grateful Life. The bestselling authors of Living Life as a Thank You return with a guide to unlocking the fullness of life through daily gratitude, exploring the recent breakthroughs in neuroscience that prove the power of gratitude. In an article for Mind Body Green, Sammons discussed how a "consistent practice of gratitude is the most effective way to connect to a sense of meaning — and to experience even more blessings in your daily living." Even in the middle of difficult times, gratitude has been proven to make people happier and healthier. Simple tips Sammons suggests for incorporating gratitude into the daily routine include "Shift your attitude at work," "Keep a gratitude journal," and "Give back." The Grateful Life is a guide to discovering—and realizing—dreams through the power of positivity. Recent studies have shown that gratitude will make people calmer and healthier, as well as bring higher levels of satisfaction to all their relationships.